Runner and writer Ed Ayres has written a new book about ultrarunning and the things ultrarunners think about: The Longest Race, lengthily subtitled A Lifelong Runner, an Iconic Ultramarathon, and the Case for Human Endurance. I had the pleasure of reading an advance (not quite final, but printed and bound) copy from the author, sent to me at his behest by his publisher, The Experiment.The Longest Race is scheduled to be released on October 9, 2012. Ed Ayres has been around ultrarunning since long before a good many readers of this article were born. He began running cross-country in high school in 1956, and hasn’t stopped running since. Among his running achievements are third place in the first New York Marathon, first in the JFK 50-mile race in 1977, and a number of US national age group championships at ultramarathon distances. In addition, he was the founding editor and publisher of Running Times magazine, now published by Rodale Press. The man knows running. 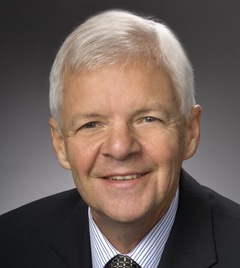 Far from being one-dimensional, Ed also worked for many years as the editorial director at the Worldwatch Institute, a research organization that develops solutions to the most difficult of world problems in climate, energy, food, agriculture, environment, and society. 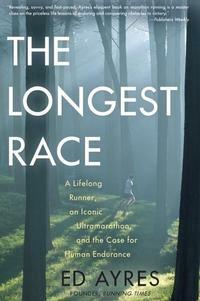 The Longest Race is presented ostensibly as a book-length race report. In November 2001, at age 60, Ayres returned to the JFK 50-mile race to see if he could break the race’s 60–69 age group record. That he did so in 7:55, knocking over twenty minutes off the previous best, is not exactly a spoiler, because Ayres’s story of how he set a record is only an incidental point of discussion. The book’s structure is built along salient geographical features of the JFK race, points where the terrain changes, and therefore also the runner’s mindset and technique. Wound into the journey are ideas about pacing, shoes, breathing, form, running alone, strategy (especially as an older runner), persistence hunting, nutrition and fueling, battling fatigue, competition, and runners’ indomitable urge to finish, along with—and perhaps more importantly—forays into non-running topics having to do with some of the Big Questions humankind should be asking itself in these critical times we live in. The connections to running are not merely metaphorical, but logically explained and elucidated. The book concludes with an appendix, a soup to nuts how-to for aspiring ultrarunners, covering training, form, gear (running can be one of the cheapest sports for participants), nutrition, and a few words about trail running, which ties in well with one of Ayers’s deeper themes: mankind’s need to be in closer touch with the planet we live on. Ayres’s writing is engaging and thought-provoking, expressing the voice of deep experience. By coincidence, I read the book just a few days before I ran the North Coast 12-Hour Endurance Run in Cleveland, the first ultramarathon I’ve run since the 24-hour event at the same race a year ago. The book offered useful refresher points on pacing, breathing, and eating, things I already know about; but being reminded, I was able to put them to immediate conscious use in the race, resulting in a better performance for me during the first six hours than I’ve experienced in life—until a major storm came along and almost blew us all away. Runners who like to be inspired by good writing about running will not be disappointed if they read The Longest Race. This entry was posted in Re: Views, Running, Sports. Bookmark the permalink.